I have been wearing makeup every day. And it has been one and a half year heretofore. But there is one thing I would like to mention, I either wear Concealer under Powder Foundation or Liquid Foundation alone, never both. I loathe the layers, I like a glimpse of my real skin even through my bad skin phase. So I tried the same method with Ponds Cold Cream and it did work, except I could not withstand the scent. Back then, I had bought a bottle of Olive oil for hair and I tried it to remove my makeup. All that I did was massage the oil onto my face and neck and wipe off with damp cotton. It did work pretty well with zero breakouts. Thereupon I concluded to follow the same method. After few days, I decided to steam and then wash off using Himalaya Neem Facewash. ( I used back in the day.) My makeup removing methods did oscillate with variations until I settled for using blends of Oils followed with a hot washcloth. I was relieved to find something that suited my combination/normal skin. The blend of Oils included: Olive oil and Grapeseed Oil in 4:1 ratio. Or Coconut Oil either mixed with Olive Oil & Grapeseed Oil. 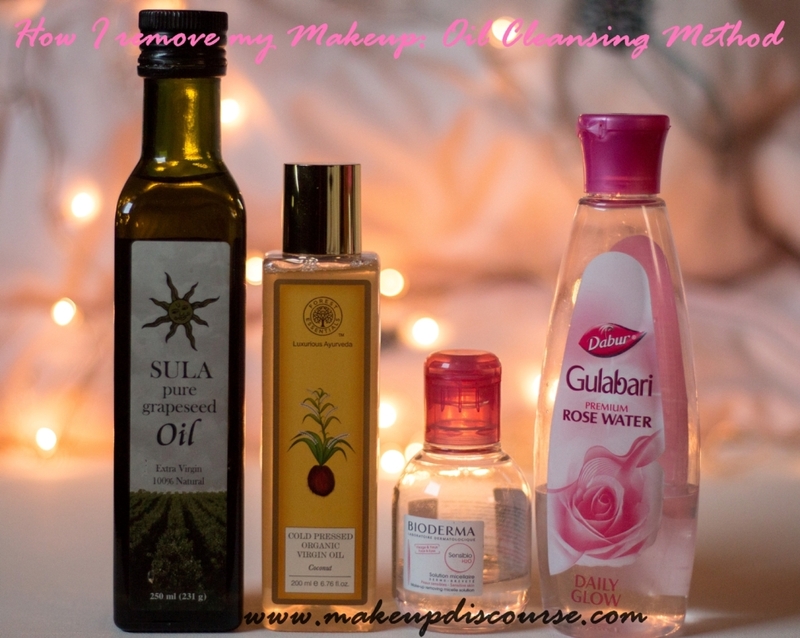 I still use the aforementioned method to remove my makeup except that I switch between Oils. Cold Processed Oils have been an integral part of my skincare. I don't purchase fancy concoctions/blends of Oils readily available rather I favour my customised blends. Fresh Seaberry Moisturizing Face Oil (Sephora Deluxe 5ml sample) converted me to switch to Oil for the night time moisturiser over my Cetaphil Lotion. I don't prefer mixing them for now since Olive oil is slightly acidic while Coconut Oil is Alkaline in nature. I am covering the pH balance in my future post. I generously spread Oil blend and massage onto my skin. After all the makeup breaks down, I spray my face with rosewater and the emulsification of Oil and water helps break down the rest. Next, I just wipe off my face in the downward direction with a baby washcloth dipped and wriggled out. Post cooling, I hydrate my face with Rosewater and follow up with my night time moisturiser. I saturate a cotton pad with Bioderma Sensibio h2O and clean away all the makeup. The Benefit: Retaining the Hydration, Moisture and Oil to maintain skin's elasticity to slow down ageing.